Fancy scrapbooks aren’t for everyone. They take a lot of time and, speaking from experience, can get pushed off for months or years. I had bought this big red scrapbook from the craft store. Man, I had so many plans for that scrapbook. 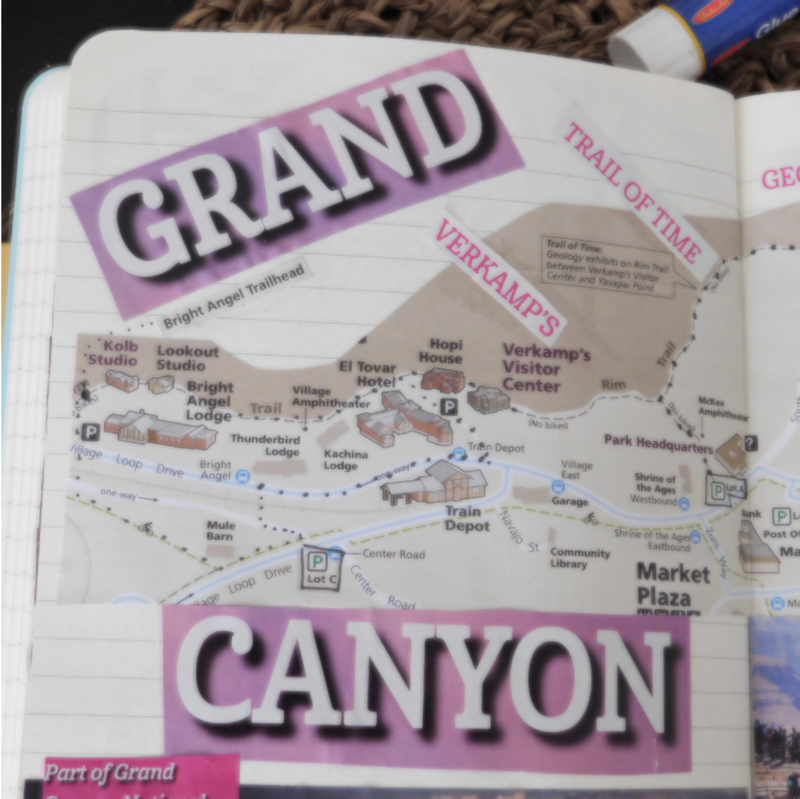 I had so many vacation memories that needed to go in that scrapbook. But, it became a burden to get it done, or should I say, get started. Maybe it was because the scrapbook was so big and took so much time to fill, or maybe because I was worried about it looking perfect since I spent more than I should have on the dang book. Either way, two pages were completed and the book sat collecting dust. I had good intentions for it but I failed at scrapbooking. 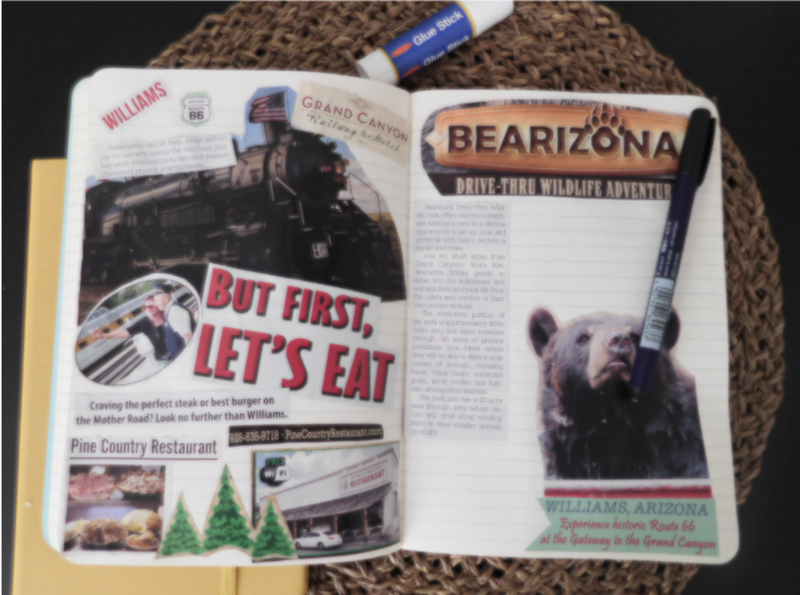 This year after a trip to the Grand Canyon and Williams in Arizona – I had to figure out some way to keep those memories on paper to look back on. I had accumulated more than 10 brochures, maps, 3-4 magazines, not even including my photos – this was a massive amount of stuff that I could not bring myself to recycle. Then it hit me, why not use my Flatline Journal to create a 2019 Travel Notebook. The Flatline is the perfect size (6×8.5 inches) for a Travel Notebook and if you like to sketch instead of writing the Flatline Sketchbook is ideal for you. I gathered all of my brochures and magazines, scissors, a glue stick, and a fine tip marker and got to work. I wrote out some simple steps to follow in hopes you will get inspired to create your very own Travel Notebook. Note: I would advise against using liquid glue, it gets your paper too wet and it will make your materials crinkle. I had jam-packed so much stuff into my trip that I had to outline what I wanted to include on each page or each spread, so my Travel Notebook wasn’t complete chaos. I used the first page of my notebook as the Title Page and below that wrote out a Table of Contents with all the trips I had taken and left room for future ones. Once I had created an overview and had a plan ready I started cutting out my material for the first trip. I cut out the logo for the hotel we stayed at, the train that we rode, and anything that caught my eye and represented things I did on my trip. 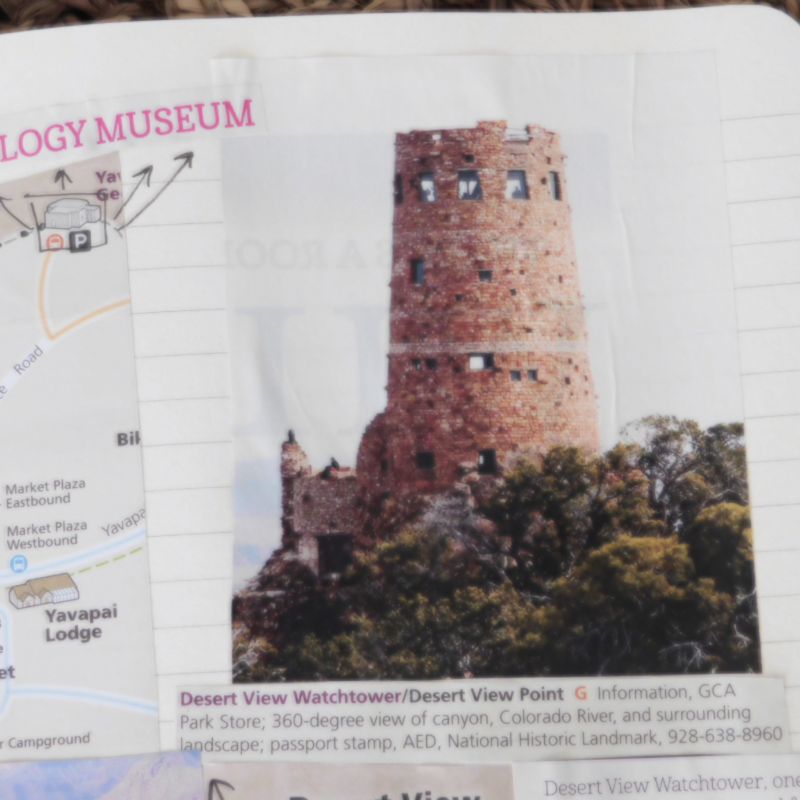 I had found a feather during one of my hikes, so I kept that and wanted to make sure it was in my Travel Notebook. I planned to cut out just what I needed for each page and then start putting the spread together one at a time. Rather than cut out all of the material for the whole vacation and have a pile of mess. Now the fun part starts! I constructed the single pages from top to bottom as a timeline of each day while on vacation. I saved the two page spreads for parts of my vacation that I needed to add more detail too. 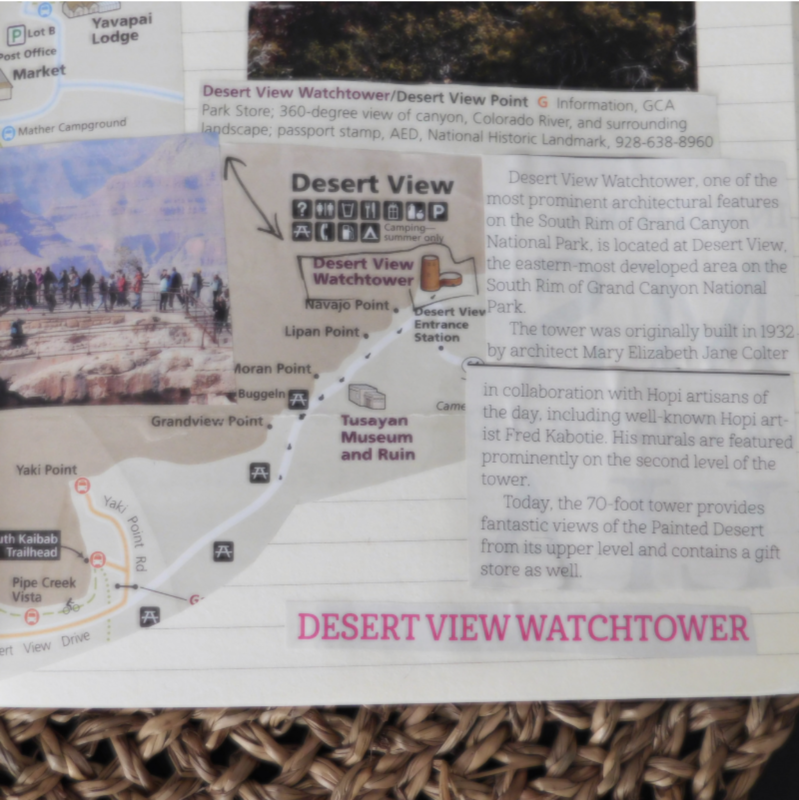 For instance my hike at the Grand Canyon I needed two pages so I could have the map that showed the whole distance. There is no special method for adding the scraps of magazines or brochures, I simply started at the top or the first part of that day and layered and glued as I needed to until I reached the end of my page which represented the end of my day. I included things like where I stayed the first night, my favorite restaurant in that town, and little things that left a mark on me. Once you have finished your first spread, you simply repeat steps 2 and 3 by getting your material cut out for the next trip on your Table of Contents and constructing your page before gluing your scraps. The Flatline Journal is not only ideal for after your travels scrapping but it’s also a great travel companion to fit in your carry-on or backpack. 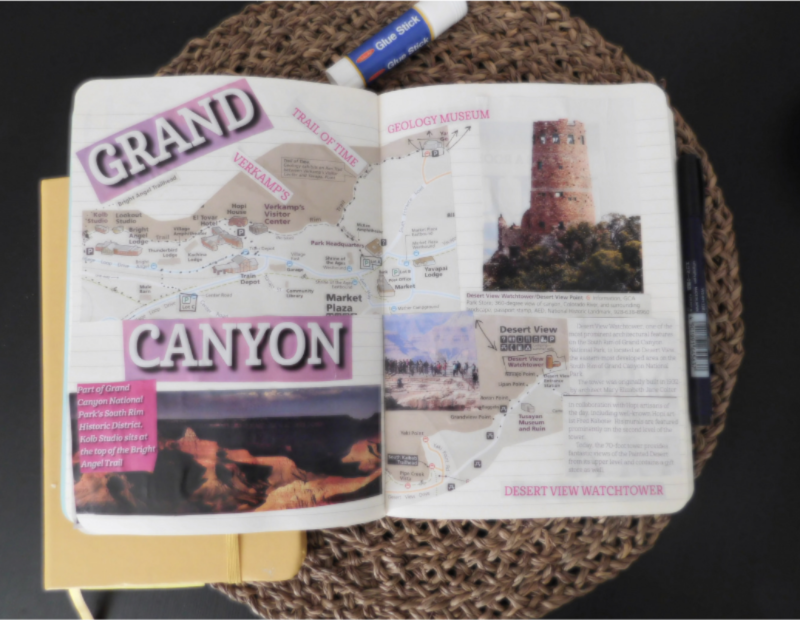 Scrapping and writing notes will help keep the memories fresh and you will have a beautiful Travel Notebook of all of your yearly travels to look back on.